Concentrated yeasts having various high activity for brewed foods. Balanced flavor. Good for short-middle term Moromi fermentation. This dose not have showy scent but has balanced flavor. Good for middle term Moromi fermentation at low temperature. This has mild scent and good for Ginjo-shu. Good for Moromi fermentation in long term at low temperature. A few acids are formed. Its foam on Moromi are light and scent of Ginjo is high. Good for Moromi fermentation in short-middle term. Balanced flavor. For fluffy Moromi fermentation in short-middle term. Low acidity yeast. The majority is isoamyl acetate. For middle-short term Moromi fermentation. S.sake (1987), S. yedo (1909), S. tokyo (1909) Having particular flavor. Strong Barbarian-weizen yeast having grove and banana like flavor. This weizen yeast has stronger banana flavor than beer yeast No.1. 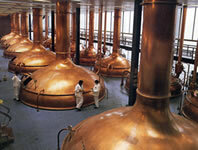 Beer made by this yeast becomes palatable and has malt flavor, dried and sharp Virgem lager yeast. Lager yeast for Munchener having common clean-cut flavor. Lager yeast having fresh scent, rich and full-bodied taste. 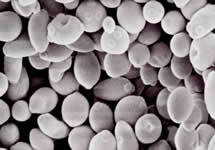 Soft and clear, common American ale yeast. Strong and sharp London ale yeast having a little diacetyl smell. High coherent ale yeast having balanced sweety and malt flavor. Ale yeast having aromatic and natty flavor. Good filtrating rate. Irish style ale yeast having full-bodied taste and fruity scent. This has vigorous propagating ability, fast ferment rate and good yield of alcohol. Nystatin tolerance yeast of Shochu yeast No. 1 having characteristic scent component. 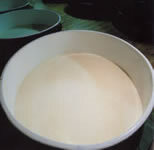 Mutant of Sake yeast. Mild taste is apt to be got. This has rapid growth in the beginning of incubation on ferment progress. Having brilliant scent and bright color. Good for tinted Miso. This is good for long aged Miso. Strong fermentation under comparatively high salt. This is good for red Miso. Balanced color, taste and scent. Candida versatilis. For long aged Miso. High aged scent. Cndida etchellsii. For long aged Miso. High aged scent.